You know you have it made when you can get Indra Nooyi, the Chair and CEO of Pepsi–boss of 300 thousand people in 200 countries toting up 60 billion dollars in revenue–and ranked the #1 most powerful woman executive in the country by Fortune— to pay attention to you. That’s what I thought when I attended BlogHer11 in San Diego earlier this month. I was there participating in the closing plenary on the future of women in media. My companions on the stage were talk show host and documentarian Ricki Lake, and Fatemeh Fakhraie editor-in-chief of the online media site Muslimawatch. Part of the future, it would seem, is here. BlogHer.com, for those who may not yet know, is the online hub for 2500 women bloggers, who reach an estimated 25-26 (after a certain point, no need to be all that precise) million women readers per month–and, it became clear at the conference, corporate America has realized they are shoppers, too. I can’t tell you how long and how insistently those of us toiling in the women’s space have been pointing to the fact that women buy almost everything. Until now, the yelling warranted a condescending pat on the head. Indra Nooyi has changed all that: her recognition, by sponsoring the conference in a big-time way, meeting privately with a select group of influential bloggers, and then sitting down for an in-depth keynote conversation with Willow Bay of HuffPo–signaled a shift. I don’t know if this is the proverbial tipping point–but it’s certainly a shift: PepsiCo wasn’t the only big name throwing swag at the attendees–100 other sponsors were there, too, including P&G, Ford and Google. And so were something like 3600 women bloggers, who had flown in from far-flung places, even other countries, to participate in three days of sharing, pumping up skills, and writing…did they ever write! It was healthily diverse, babies were swaddled and seemed to be absorbing the presentations–in other words, a safe place for women who blog. BlogHer was founded in 2005 by Lisa Stone, Elise Camahort Page and Jory Des Jardins in answer to the question “Where are the women bloggers?” They found a few and now have a staff of 50 people in NYC and Silicon Valley–and have financial backing from Venrock, NBC’s Peacock Equity Fund, and Azure Capital. With its strength in aggregating, it would seem to have found a similar economic model to the Huffington Post…except BlogHer does have a sharing model as well, based on individual bloggers’ traffic. All you women out there banging away at your keyboards: take note. Carol, thank you so much for creating the time and attention yourself to join us in San Diego and to help lead women into the future of media in our closing keynote. Your advice to the community — to continue to evolve the place and role of women and women of color in the media — was fantastic. Here’s the transcript for folks who weren’t able to join us. 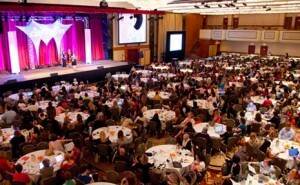 BlogHer ’11 was special — and not just for me personally. I feel an important and long-awaited shift finally snapped into place in the past 12 months. Blogs by women — women’s voices — became the most trusted and valued source for information and advice by women who read blogs, according to our research with Nielsen. Women who read blogs now trust these blogs so much they beat corporate Web sites and social networks for information and advice. On the advertising/publishing side, our team has found 100 percent widespread acceptance of the value of women who blog by marketers who seek to influence and persuade what women believe, what we want and what we buy – for the reasons you describe above.